Welcome to Tuesday Review, as well as post number 1000! Woot! Today's book is a children's classic, in honor of my recent visit to my new nephew. And when I say children's classic, I don't mean a chapter book, but a picture book. 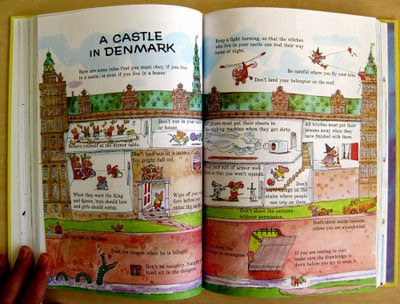 Richard Scarry's Best Storybook Ever. This book was one of my favorites as a kid. I read it to my baby brother over and over. It's one of the first books I bought for my children and read over and over. Scarry's illustrations are whimsical, all animals which dress, walk and behave like people. They focus on manners, colors, shapes. Some stories are familiar fables and tales, like the country mouse and the city mouse. So, for the child in your life, as well as for yourself, I highly recommend picking up this weighty book. 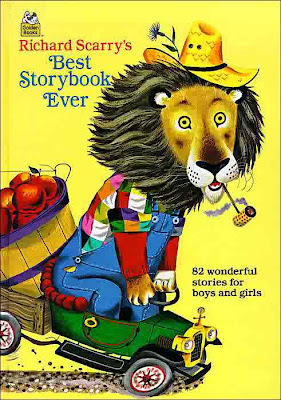 It combines many of the best Little Golden Books around and will keep a young child entertained for years. Oh, and always keep your eyes open for Lowly and Goldbug! i have several great story books like this... they were mine when i was a kid... one is called 365 bed time stories the other is ummm great brain is not functioning yet... will have to check later when bradley is not working on the house. My kids were huge Richard Scarry fans, I don't know how we missed this one. Thanks for the reminder. I'm going to order a fresh copy to go in my "grandma's library." This is great. I loved his illustrations as well. Update--my new RSBSE is on it's way to my house from the Amazon. Hmmm wonder why my book orders come from the Jungles of South America?!? I love Richard Scarry! I had a set of his books when I was little and remember reading them over and over again! Richard Scarry~one of the best children's book authors EVER!!!! I used to read this book to my brothers (now 41 and 43) when I was 8 years old. We read it over and over until it fell apart. My fav book from childhood? The Snowy Day by Ezra Jack Keats. I slept with that book, and cried when it fell apart and HAD to be thrown away.